We were also sent an individual story reel, The Tale of Jemima Puddle-Duck. 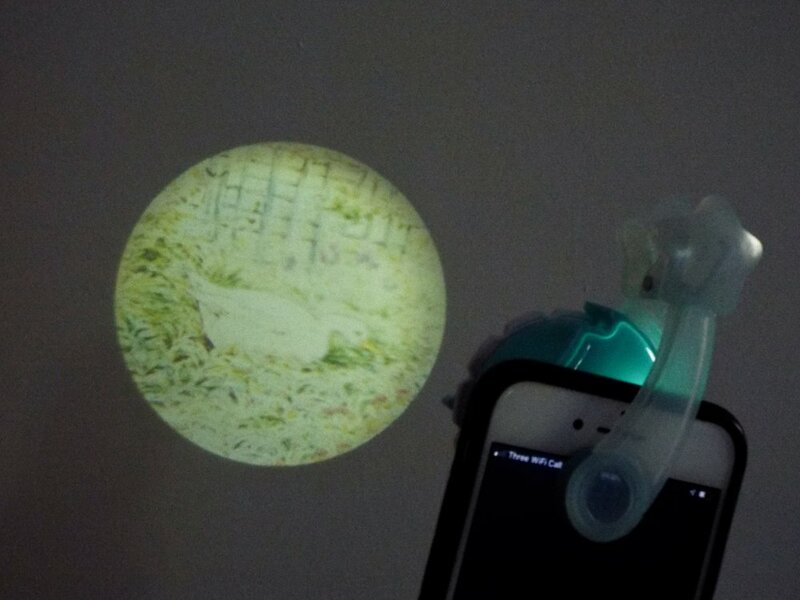 The projector is really easy to clip onto your phone, using the Moonlite app you are guided where the clip should be positioned, aligned to the iPhone light. The light projects the picture from the reel on to the surface. On the projector is a small nob which you can turn to adjust the focus of the image, so you can achieve a perfectly clear picture. It is really easy to set-up and uses. Open the Moonlite Storybook Projector app, and type in your 10 digit code. Your story will appear on your screen, resembling that of an e-book. In addition, the Moonlite Projector displays pictures with a corresponding illustration to the part of the story on the wall or ceiling. As you read your story you turn the reel manually to change the picture/slide and each reel consists of 12 pictures/slides. When reading a story with Moonlite it comes alive, playing charming and soft sound effects, which creates an engaging and magical storytime experience for you both. Even if you have already read these stories to your child, reading them again using the Moonlite Storybook Projector will enhance the experience. Moonlite is available at all good retailers including The Entertainer, Smyths Toys and Amazon. Moonlite Gift Pack RRP £39.99 and the Moonlite Story Reel has a RRP of £7.99.